The days of Raffles being the only luxury accommodation option for those visiting Cambodia’s Angkor Wat temples are well and truly over, especially now with the arrival of Phum Baitang – a collection of 45 private villas set in eight hectares of secluded gardens and rice fields, just ten minutes’ drive from Siem Reap. This Khmer village-style retreat is the second opening from Zannier Hotels, backed by the French textile family of the same name, and following on from its success with Le Chalet Zannier in the Alps. ‘The accommodation is designed as stand-alone pavilions on stilts . 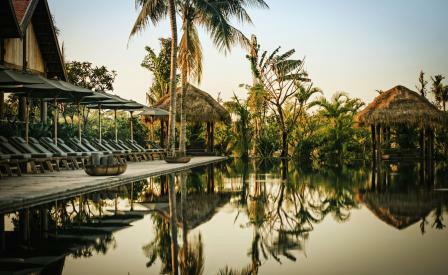 . . reminiscent of the traditional houses commonly found in the Cambodian countryside,’ says Reda Amalou, founder and partner of AW2, the firm behind the design, as well as other top Asian hotel hits such as The Nam Hai and Six Senses Con Dao, both in Vietnam. Here, AW2 has followed local architectural inspirations through the use of natural colours and textures – think timber and stone – not to mention the central focus provided by the resort’s terraced rice paddies. Hotel facilities, meanwhile, include a spa with seven treatment rooms, plus sauna, steam room and yoga pavilion; 50m outdoor infinity pool; a cigar and cocktail lounge in a 100-year-old farmhouse; two restaurants (one Cambodian and one international/fusion); plus all the usual luxe mod-cons within the villas themselves. Angkor Wat is of course the main draw, but also of interest nearby is Tonle Sap – the largest freshwater lake in South-East Asia – alongside a string of fishing towns and floating villages to explore. We also particularly like Phum Baitang’s cookery classes, where guests shop at the local market with the resort’s resident chef, who then teaches them how to make authentic Khmer cuisine.